Academic achievement and excellence to develop each student as an independent learner. Providing the appropriate level of support to respond to the individual student needs. Roll: about 1373; 37 International Students. Rutherford College is a community where striving for personal excellence is the focus. Student needs are put at the centre of a personalised learning system is which learning is made meaningful for them. A high expectations culture exists and high standards of academic, sporting, cultural and social achievement are attained. 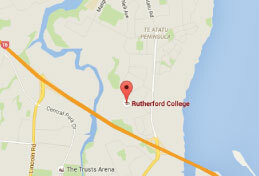 Rutherford College is located in a residential coastal area of west Auckland only 15 minutes from downtown Auckland city. West Auckland is known for its spectacular surf beaches and bush walks. It also has many sports facilities, parks, cafes and shopping centres. Rutherford College A student advisor will be in contact within one working day.